The Co-op’s CRT Rural Store is proudly displaying a new plaque after being named as one of five national finalists in the CRT National Community Member of the Year award. 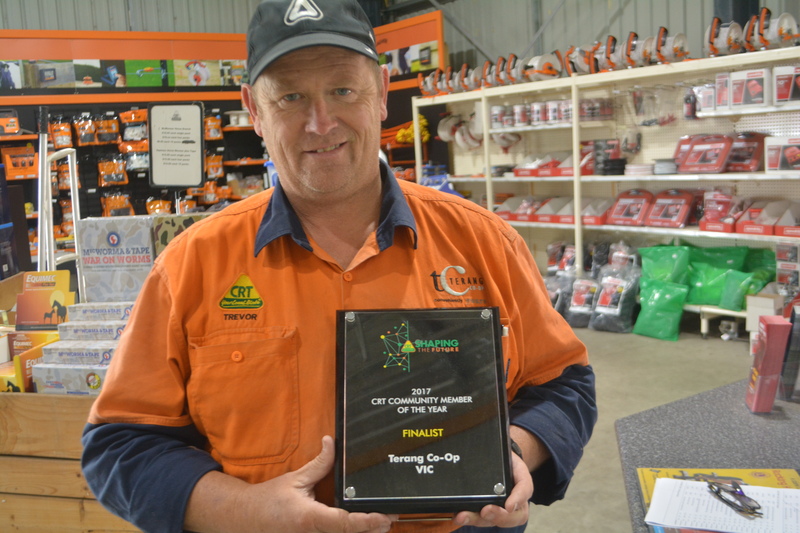 Terang was the only store from Victoria to qualify for the final, along with three stores from Queensland and one from New South Wales. The national title was won by Farmcraft from Kalbar in Queensland. CRT manager Trevor Dowd said the national exposure had been great for Terang. “Our story was shown on the big screen at the national CRT conference in Perth, which is great exposure for our little community,” Trevor said. It was the second year in succession that the store had been named as a national finalist. “Other stores from around the country came up to congratulate us on making the finals,” Trevor added. CRT is Australia’s largest group of independent rural retailers with more than 300 stores servicing all major sectors of the rural industry.